Hardly anyone thinks of Amazon as an ad business -- but that could be changing. 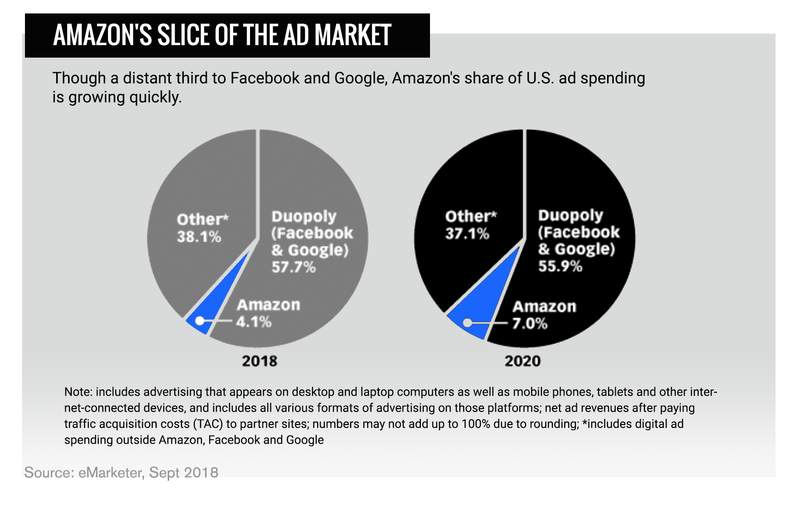 Amazon ads make up a growing share of the online ad industry, and Amazon is doubling down in grabbing market share from Facebook and Alphabet. Amazon wears many hats -- retailer, gadget maker, cloud provider, Hollywood producer -- but until recently, ad titan wasn't one of them. At least, few people thought of Amazon (AMZN - Get Report) that way. But that's changing. This week, a report from eMarketer revealed that Amazon is now the third most-popular digital advertising platform, edging out Verizon's (VZ - Get Report) Oath for the spot. U.S. advertisers will spend $4.61 billion on Amazon's platforms this year, accounting for 4.1% of all digital ad spending. That's still a distant third to the two reigning kings of Internet advertising, Alphabet (GOOGL - Get Report) and Facebook (FB - Get Report) , which together account for 57.7% of all digital ad spending. But as eMarketer notes, that distribution could change: Amazon's share of the market is projected to double in 2018, and reach 7% by 2020. "Amazon has the ingredients for a truly powerhouse digital ad business, the key to which is doing more than just selling ad impressions," wrote eMarketer's Nicole Perrin. Those of us who use Amazon primarily to shop or to watch video may be barely aware that Amazon even has an ad business -- but its increasingly robust ad products include paid ads on its own marketplaces and facilitating ads on other sites. As the default first stop for many online shoppers, Amazon has more detailed data on commerce and purchase habits than its competitors, and potential advertisers are taking notice. Just this month, Amazon announced a number of changes to simplify the process of buying ads, which included consolidating all ad purchasing and reporting under a single "Amazon Advertising" brand. In a blog post, SVP of Amazon Advertising Paul Kotas described the change as " another step towards our goal of providing advertising solutions that are simple and intuitive for the hundreds of thousands of advertisers who use our products to help grow their business." Amazon is experimenting in other areas that merge browsing with automated suggestions: It's also experimenting with a service called Scout, which serves up suggestions for particularly visual products like home furnishings and shoes, based on your likes and dislikes. In a statement, an Amazon spokesperson described it as "a new way to shop, allowing customers to browse millions of items and quickly refine the selection based solely on visual attributes." A shopping site, a data experiment or another potential revenue source? With Amazon, it can be hard to tell. Unlike Facebook for example, Amazon doesn't break out advertising sales. The majority of its net sales come from its online store, at $27.1 billion for the June quarter, with an additional $9.7 billion from third-party seller services. Amazon Web Services, meanwhile, accounted for $6.1 billion in net sales, and advertising is lumped into an "other" category that accounted for $2.1 billion in sales for the quarter. But even though it's still a small part of Amazon's revenue, advertising isn't just a footnote anymore. On Amazon's July investors' call, CFO Brian Olsavsky called out the advertising business as a rising star, saying that it was starting to "make an impact" on Amazon's overall gross profits. "It's now a multi-billion dollar business for us," Olsavsky said. "We're seeing strong adoption across a number of fronts. Amazon vendors, sellers, authors as well as third-party advertisers who want to reach Amazon customers." Amazon the ad king may not compute with consumers, but for investors, it just might add up to something soon enough. Amazon, Facebook and Alphabet are holdings in Jim Cramer's Action Alerts PLUS member club. Want to be alerted before Jim Cramer buys or sells AMZN, FB or GOOGL? Learn more now.